Rocks on the Earth’s surface are cooled, hardened, eventually forming rigid plates that move around relative to one another. When two plates converge, one plate overrides the other, which sinks into the Earth’s deep mantle. The sinking plate carries water, which softens rocks and also affects the behavior of the sinking/overriding plates and surrounding mantle flows (“subduction dynamics”). To investigate the role of water in subduction dynamics, 2-D fluid dynamical simulations were performed. The simulations suggest that subduction dynamics change significantly with the level of hydration of the sinking plate, which is represented by the thickness of a hydrous layer. When the hydrous layer is thin (Figure 1b), the plate sinks rapidly with a shifting boundary and stagnates above the lower mantle. In contrast, when the hydrous layer is thick (Figure 1a), plate convergence is sluggish, the plate boundary remains stationary, and the sinking plate penetrates into the lower mantle. These results indicate that a small amount of water is expected for the northwest part of the Pacific Plate, characterized by the rapid convergence, plate boundary shifting, and stagnation of the sinking plate. Figure 1. Results of the two-dimensional numerical simulation. (a) Case of 27.5-km-thick hydrous layer in the subducting plate. (b) 15-km-thick case. The colored contours show the water content in hydrous rocks. 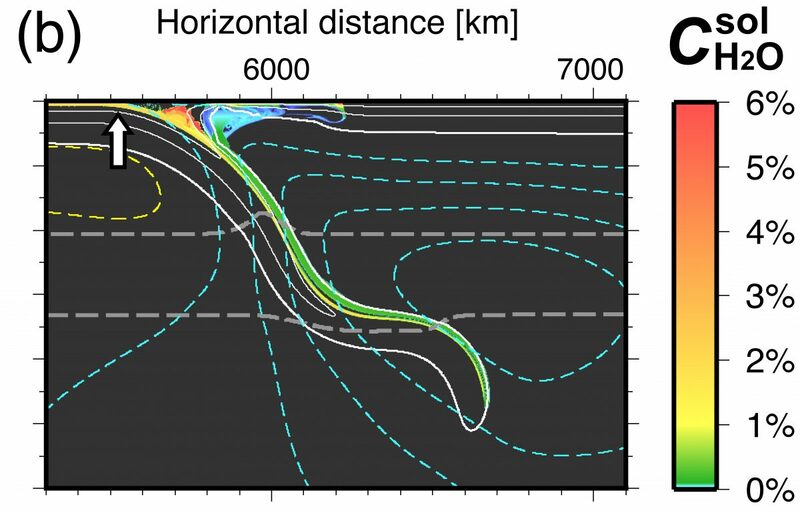 The solid white lines represent isotherms (400, 800, and 1200℃), and the gray horizontal dashed lines represent the 410- and 660-km depth boundaries. The yellow (light blue) dashed lines are the clockwise (counterclockwise) stream functions of mantle flows (10−4 m2/s intervals). White arrows denote trench positions.